Optoma is slowly and steadily expanding its projector portfolio in the Indian market and HD27 is their latest offering that caters to home entertainment users. The HD27 is a nice compact projector that weighs in a just under 2.5kg and portable enough, in case you want to use it across different rooms. to let enough air pass to keep the projector cool. Additionally, Optoma HD27 also bundles a remote control that allows to use it even when mounted to a ceiling. The HD27 is fairly easy to setup and use. The HDMI ports can be used to connect to a source or use the MHL-enabled HDMI port to connect an MHL-supported device. The projector also comes with a built-in 10W speakers that works well in a small room but it’s recommended to connect external speakers, if you’re going to use the projector in a medium to large-sized room. When it comes to optional accessories, Optoma offers HDCast Pro that makes it easy to stream from an Android or an iOS device or use WHD200 for a true wireless setup. The HD27 also supports 3D content, however, you’ll need to invest in 3D active shutter glasses. Performance-wise, the HD27 offers good visuals and accurate colour reproduction, thanks to Rec. 709 standard support. 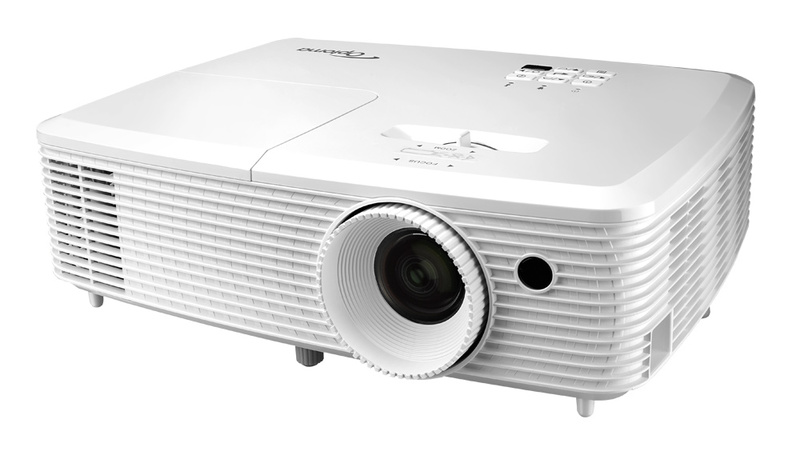 The projector supports Full HD resolution with a maximum projection size of up to 300-inch and the good part is that it supports 3200 ANSI lumens of brightness, which means you don’t require a pitch dark room to enjoy content. The lamp life in bright mode is rated to give about 5000 hours and about 1000 more if you watch it in eco mode. There’s even a dedicated gaming mode that helps by improving response time, contrast and colours. Optoma HD27 is priced at Rs. 99,750 and makes a good choice for a home entertainment projector due to its overall performance and decent brightness support.